Happy Friday, quilters! 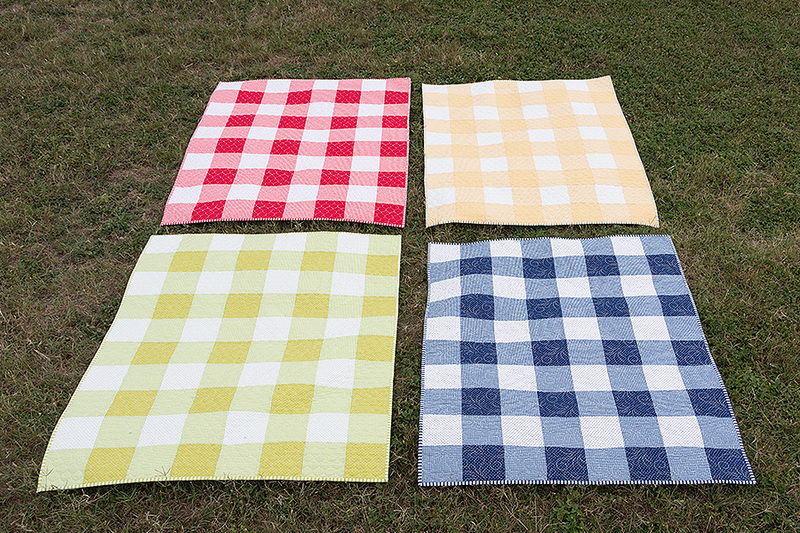 A while back, we got a request from one of our YouTube subscribers for an easy gingham quilt. Yes, gingham quilts are made up of rows of straight squares, but could we make it even easier? We took on the challenge and did it! Today, we are presenting the 3-Hour Baby Gingham Quilt. Three hours is long enough for you to make this quilt from first cut to finished quilt top. Intrigued? Grab the free 3-Hour Baby Gingham Quilt pattern and press play below to see how we did it! We used the Essentially Yours basics line from Moda Fabrics to create our 3-Hour Baby Gingham Quilt. This collection of mini dots, checks and strips has an awesome array of light and dark values that mix so well. The most important part of this quilt is choosing the right tones to make it monochromatic, like a true gingham fabric, so in the free pattern, we have listed six color combos from Essentially Yours to make red, blue, yellow, lime, aqua and gray versions. There is nothing that feels as fresh as a simple gingham quilt! This quilt is so quick to whip up as a baby shower gift, but I have a hankering to use it for picnics this season! We hope you enjoy this sweet, simple beauty (and especially how fast it comes together). And of course, share them with us on social media! Comment and let us know what you think, and if you have any other ideas for our next video project! Oh love this! What did you use for the binding? And the back? I click on the link for the free pattern, and it sends me to YouTube; am I missing the correct link somewhere? Not only is this a great quilt on its own, it would make a great quilt back! Two quilts in one! When I click on “free pattern” it just gives me the You Tube video. How do we get the actual pattern. I am curious about the suggested 6 combos and want the sku’s. BTW, so cute! Hi Debbie, sorry for that, the link has been updated to go to the free pattern now. Thanks for your patience! Hi Lisa, sorry for that, the link has been updated to go to the free pattern now. Thanks for your patience! Hi Dorothy, happy to provide some Bella Solid suggestions. WHat colorway are you thinking you would like to make? So cute – I can’t wait to try it. I’m a gingham girl! I really want to make this quilt but don’t know how Mach yardage to get for the backing. The finished size is 40 1/2″ x 50 1/2″. So do I need 1 yard or more for the backing? Same ? For the binding. Please help – I’ve got the other fabric in my cart. Hi CHristine, you can find those yardage requirements in the free pattern! THere are links to the free pattern in this blog post. Thanks Jocelyn, I just now see it! I just made this in red turned out super cute! I’m calling it a picnic blanket. Just the right size for a couple to take to the park.